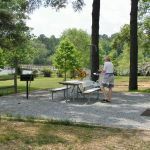 Ask fellow campers about "Georgia Veterans Memorial State Park" and nearby attractions. We stayed four days at this campground with our family. There were highs and lows, so I'll summarize that way. It is a very clean and spacious park. We were in the loop off the lake, which was easy to navigate in our TT. The park overall is spacious. There is a trail which was easy to navigate which left from our campground. The laundry was cheap ($2.00 to wash and dry.) There are several playgrounds, one in the campground. The check in process was not clear, nor was the signage. The visitor Center did not provide us (nor mention) the "gate code" which was a surprise when the gate to the campground campground closed at the absurdly early hour of 7:00 pm. No signage at the gate to let us know ahead of time that the gate closed so early. The campground hosts were nice and busy, and the park was sparkling clean, but the rest of the park (outside the CG) which is managed by some resort company seemed well-worn. We camped at Georgia Veterans Memorial State Park in a Travel Trailer. This state park is a resort complete with golf course, restaurant, marina, frisbee golf, excursion train and a huge field for remote controlled planes. The camping area is well-maintained and clean. Our site was a back in right along the water with fire ring and picnic table. The park was quiet and had some apparent features that would make it very family-friendly. WiFi was down when we were there. Navigation is tight, had to squeeze between trees to get to camp site. Campsite roads are very rough. Would definitely disconnect any tow vehicle before turning into campsites. Also directions given to us were incorrect. It is a very pretty park with many lakefront sites, there is a good (free) museum of military memorabilia from the revolutionary war up through Desert Storm and a display of military vehicles, plane and helicopter. The only downside is that it is not FHU. We are in a 40ft MH, would definitely stay there again. We camped at Georgia Veterans Memorial State Park in a Motorhome. I'd go for a 10 overall except for the fact that you have to go up to the lodge to get wifi. It works well there. Some ants, but as long as you're aware and practice your normal precautions it's not a problem. Otherwise it's a great location and we try to route through here if at all possible. The SAM railroad excursion which leaves from the park looked neat. When we return next time we'll program it into our plan. We camped at Georgia Veterans Memorial State Park in a Travel Trailer. This state park is a resort complete with golf course, restaurant, marina, frisbee golf, excursion train and a huge field for remote planes. It also has nice hiking trails. The camping area is well-maintained and clean. Our site was a back in right along the water with fire ring and picnic table. The park was very quiet and had some apparent features that would make it very family-friendly. Wi-Fi was available but only in specific locations. As far as we could see it was not mentioned on their website but, if you come in after 5 o'clock, you actually go to the resort to register and get the entry gate code and then go to the visitor center the following day to complete the registration. It is important to call for reservations. We found it hard to get through on the phone. We were calling at the last minute for just a one night stay but the online reservation system seemed fine. We camped at Georgia Veterans Memorial State Park in a Travel Trailer. We camped at this location on our way to and from Florida, so each way was just an overnight stay, not the destination. We found that signage and communication at this park were very poor. On the way down, we never saw where we needed to check in so there was confusion there, and on the return visit, we arrived at 5:30 pm to find the visitors center and the gate into the campground locked up. Fortunately my cell phone worked there and so I called the main number and got someone to give us the code to the gate. She said there should be a packet for us near the gate, but I never found one. Some of the navigation appeared to me to be a bit tight for folks with large 5th wheels, but since we don't have a trailer that large, I couldn't say for sure. I can't speak to any of the other amenities, but it appeared that there was a restaurant and sometimes live entertainment. Since we never really received any campground info, I am unsure about what all was available. It is a very pretty park with many lakefront sites, there is a good (free) museum of military memorabilia from the revolutionary war up through Desert Storm and a display of military vehicles, plane and helicopter. It is good to see a nice memorial to our veterans. The gnats are very bad, but that is not the campground's fault, just a feature of South Georgia. We camped at Georgia Veterans Memorial State Park in a Travel Trailer. CALL AHEAD to find out what to do for after 5:00 check ins and be aware that the regular check ins are done at visitor center straight past the plane. Terrific setting, well maintained, easy access to the lake. Sites are spacious and level. Waterfront sites have a great view. 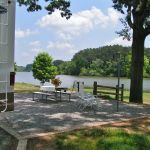 Playground, disc golf, model airplane flying field, boat ramp and 2 restaurants accessible to campers. Campground has security gate and on-site host. Only downside is there is no sewer at the site. Must use dump station A real gem. We'll be back! We camped at Georgia Veterans Memorial State Park in a Motorhome. Don't let your GPS take you on Ferry Landing Road, stay on US 280 to the park entrance Cordelia's Restaurant on the grounds is terrific. Visit the on-site museum and for a fun day, ride the Sam Shortline train to Plains. Departs right from the park. The grocery at the Citgo station across the street from the park is excellent including a butcher shop with fresh meat. The Daphne Lodge about 1/2 mile away on US 280 is really good Try the cheese grits! We camped here as a one night stay for traveling. Because we arrived after office closed out reservation was posted on a board with a few others just outside the camping gate. It showed our site number and gate code on it. This is a beautiful park with large spread out pines and fairly large sites, especially away from the river. Many are pull through, but some could also be a little tight due to trees. Only complaint to the park is that it was numbered in no specific order. Numbers are not sequential as you would expect. They provided no map with our late entry, so until we were finally flagged down by one of two camp hosts we were frustrated. Once the site was located everything was great. Great site and clean bathrooms. Bathrooms were just starting to show wear in some areas with broken tiles. In the morning I went to check in at the office which is part of a Veterans museum, a must see that is free. Office and host personnel were all friendly and helpful. We camped at Georgia Veterans Memorial State Park in a Fifth Wheel. Stayed a night over on our way home and was very impressed with the park as a whole. Campground was well laid out with easy in and out for our B+ with quite a few larger rigs already there. Gnats were horrific! Restrooms were well used but very clean. Would definitely stay here again if on our route. Not the best destination site for us. DW's Verizon & my ATT both came in strong and clear. Our ATT hot spot was flawless. We camped at Georgia Veterans Memorial State Park in a Motorhome. Had diner at Cordelias, part of the Lake Blackshear Resort & Golf Club. Totally impressed with the service, food & prices. For a place that is as fancy as this the prices were very reasonable for the excellent quality food we received. This is a very nice campground. Unfortunately, there were gnats everywhere and made it impossible to sit outside. We parked in the loop not by the water. The sites were spaced farther apart and not as many people. We camped at Georgia Veterans Memorial State Park in a Tent Trailer. We were able to find a couple of geocaches in the park. Next time we'll check out the lodge lounge and restaurant in the park. We stayed for 1 night as a stopover on the way to Florida. 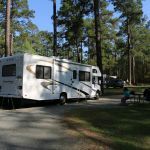 This was a very nice campground and our site was on Lake Blackshear. Had a display of airplanes, helicopters & other military equipment that was very interesting! Would stay longer if we were in the area again. We camped at Georgia Veterans Memorial State Park in a Travel Trailer. We had made reservations for 3 nights with the hopes of staying a few more days if we liked it....it was beautiful! We arrived late on a Sunday and found clear directions at Welcome Center for late check in...drove up to campground and found our paper with our name on it. This park is a first come first serve and apparently we got super lucky and got a huge spot right on the lake. It was dark so wouldn't see our surroundings until the next morning. Gorgeous park....quiet and well maintained. We checked in and was greeted by a very nice gal at the desk that answered all of our questions...where to buy propane(across street at Bait shop) where to get groceries (across street at Stiplings General Store) and laundry (they had facilities at the park). We hiked and biked here, great trails setup. Tried to go to the Cypress Grill didn't know that is open only seasonally and sometimes only the weekend. Enjoyed Cordele's though...great lunch and even better dinner. The little lounge in main lodge was also very nice. Water service and electric were on point. No sewer but totally fine and used dump on way out which was clean. Also take note the SAM Train only runs on weekends as we didn't know that either and was little disappointed but the park more than makes up for that. We camped at Georgia Veterans Memorial State Park in a Travel Trailer. Check out Stiplings across from park entrance...great meats and store has quite a bit no need to venture back to town. Also Dollar General 2 doors down for all of your other needs. Really a nice campground. One of the vest state parks we have stayed in. We had a huge pull thru site close to the lake. We were lucky to get the site though because it was very full and you do not get an assigned site. It seemed that people were having spaces saved for them because chairs were blocking open spots and someone was putting reserved tags on sites and the people were coming in late at night. No sewer hookups if you plan on staying longer and out sit only had 30 amp service. The wifi worked great as well as the cable. Only negative was the black gnats, they were everywhere probably because of the lake. We would definitely stay again. We camped at Georgia Veterans Memorial State Park in a Fifth Wheel. The International Habitat for Humanity is close by and was an eye opening place to visit. This CG is associated with the Lake Blakeshear Resort. Sites are non-specific, so get there as early in the day as you can to have a shot at the best sites. The posts that are painted green are 50amp, the ones that are unpainted are 30 amp (we were not told this upon check in). About 1/3 of the sites are "water" sites. The sites are a little tight for my liking and I was disappointed to see them adding more sites in part of the CG. Those sites were even closer with no trees or other vegetation to afford privacy. There is good WiFi available in the CG. The bathrooms are old, but well maintained and fairly clean (all except a sour smell because someone didn't clean out their mop one day!). There are static military exhibits that are pretty interesting - several tanks and airplanes from the WWII and Vietnam era. This CG is very convenient for those traveling I-75 or U.S. Hwy 280, both major roads. There is one general store with fuel (gas and diesel) in the area, in fact the general store has a pretty respectable meat market. The Park/Resort has golf, a short-line railroad that runs to Cordele, Ga., a couple of restaurants, frisbee golf, and an RC flying field. Geocaching is promoted in this park. We camped at Georgia Veterans Memorial State Park in a Fifth Wheel. My wife and I just returned from a 4-night visit to Georgia Veterans Memorial State Park. This is a park that we've wanted to visit for quite some time. We certainly weren't disappointed. 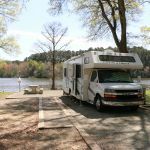 The sites are very roomy and the manner in which the sites are arranged RV'ers are afforded a high level of privacy. The employee checking us in was very nice, polite and helpful. We will return to this park again as it is about 100 miles from our home. I would've given the park a 10, but I just can't give a 10 w/o sewer connections at the site. There are a several interesting places to visit in the area. Plains, GA (Home of former US President Jimmy Carter), (Andersonville National Historic site which includes the former site of Camp Sumter "Civil War" military prison, the Andersonville National Cemetery, and the National Prisoner of War Museum, which opened in 1998 to honor all U.S. prisoners of war in all wars) and the (Habitat for Humanity Global Village & Discovery Center in Americus, GA). We camped at Georgia Veterans Memorial State Park in a Motorhome. This was our second overnite stay at this campground. We chose a 30 amp pull thru site at the back of Loop 3 since we did not need to run air conditioning. Sites are generally spacious and offer some privacy. The park offers many inviting attractions for longer stays such as lake sites, lodge, golf, Sam Shortline train and military history. The park is located about 10 miles from Cordele. Stripling's Meat Market near the entrance is well worth a visit. We camped at Georgia Veterans Memorial State Park in a Fifth Wheel. SAM train is nearby and the park does holiday activities. Cordele is just a few miles away. Plenty of stores to buy food and such near the park. The military museum was very interesting. Beware: alligators are in the water next to the campground. This is a first-come first-serve site selection, even with reservations. Come early, and you can also move to another site when it becomes available. Hiking, Biking, Canoeing, Fishing, golf, Frisbee Golf, Museum and model airplane field plus more at park. Great fresh sausage at store opposite entrance on 280. Telephone museum and farmers market in Leslie is ten minutes west. Tremendous amount of history to explore in this area. Stripling's General Store (almost at park entrance) is a wonderful old-fashioned grocery store and meat market. Bring plenty of ant spray! Are you affiliated with Georgia Veterans Memorial State Park ?